Within the context of the relationship between Rama and Sita in the story 'The Ramayana of Kamban, duty is worth the sacrificing of love, because his duty is fulfilled to maintain order within the society and above all, order is needed for a society to run, teamwork is an important principle in management, and Rama applied the same in search of Sita and was successful in the mission. Another one is in an organization one must be treated affectionately which Rama did when he met Guhan and Vibhishana. 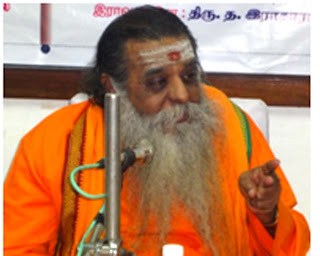 Management principles such as encouraging lower category of employees, rewards for good work, self-motivation, decision-making, recognition, market survey, market exploitation, time management and the art of communication are aligned with instances in the epic of Ramayana of Kamban, Prof.Arivoli added. While appreciating Guha, Tamil scholar Prof. Arivloli valued Guha as innocent and lovable king of Srngaverapura, what is presently known as Singraur, in the banks of Ganges. He was introducing Guha in a debate in Trichy organized by District Muthamil Kalai Panpattu Maiyam and Kamban Kalagam on 26th December 2010. Prof Arivoli added that by profession Guha and his subjects were boatmen and hunters. From a description of the boats, we understand that these were not ordinary ferryboats. Kamban in fact details how the chariots in which Bharata came later, were dismantled piece by piece and were assembled again in the other bank of Ganges, ferried by the large boats of Guha, rowed by hundreds of oarsmen. Kamban introduces him as a friend of Rama. “The king of that territory, Guha by name, was a friend of Sri Rama, dear to him as his own life. He was a Nisada by birth, possessed of bodily as well as military strength ,owning as he did a large army consisting of all the four limbs, viz., elephants, chariots, horsemen and foot soldiers and well-known as a ruler of Nisadas.” Guha was no ordinary mortal. He was the Chieftain of the tribe of the Nishadas. A man of great prestige and power. By no means an ordinary hunter. When Guha heard that Sri Rama was in his Kingdom, he leapt with joy and rushed towards Sri Rama to greet him. He, flanked by his friends and relatives, went to the hermitage of the sages where Rama was staying. Kamban paints a picture of pure devotion, love and rustic innocence when he narrates the first meeting between Guha and Rama. As soon as they reached the hermitage, his followers stood in a corner outside it.’ Guha unfastened the arrow-case and bow he was carrying and kept them down reverently, outside the ashram.’ Guha was so careful about these things. But when Sri Rama and Lakshmana rose to greet him, he became calm and peaceful and hesitated even to speak to his guests.Sri. Rama, perceiving Guha's hesitation, hugged him to his bosom and holding him at arm’s length introduced him to Lakshmana. “Do you remember him, Lakshmana? He is my dearest friend Guha, the King of Sarayu". Never did Sri.Rama mention that Guha was a hunter, much below their status, even to get acquainted. He got a place in the great epic ramayana because of his meeting with Sri Rama and his unlimited affection on Sri Rama. But the epic of Valmiki is silent about details such as how and when they became friends. It just mentions they were close friends. Kamban makes a small detour here as well. He gives a detailed description of his appearance first, which is not to be found in Valmiki. Guha had a drum with him, being a hunter, and a hunter’s dog too. And we gain a glimpse on the dressing habits of those days with a verse of Kamban. . He had quite a strong physique and a real simple and honest mind. He heard about the arrival of Rama to his place and was too eager to see him. Rama had at that time crossed the limits of Ayodhya and reached the forest, somehow managing to divert the attention of the people who followed him when they were fast asleep in the night. He was received by the sages in the forest and had his food with them – fruits, leaves and vegetables. Guha had immense admiration for Rama and wanted to see him. Duty has the regular definition of a moral or legal obligation, a responsibility, or a task or action that someone is required to perform. However, in the context of the story of Ramayana, duty, or dharma, has a more specific interpretation. Dharma is a set of laws or principles carried out with the purpose of creating social and religious order in the society. In this story of Ramayana, many times this duty conflicts with other values or personal desires, forcing characters to compare the choices of following the dharma or fulfilling another human value. The Chairman of Muthamil Kalai Panpattu Maiyam and Kamban Kalagam, noted Tamil Scholar, Prof.S.Sathiyaseelan welcomed gathering and Tamil orator R.Maadhu proposed vote of Thanks in Kalaiarangam premises. –Etram news service & News Line.